The grey dreary weather got me thinking of photos from warmer times. 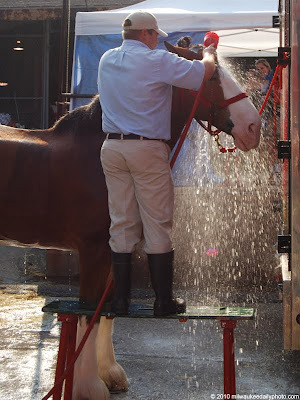 This shot from last August shows one of the Budweiser Clydesdales getting his daily wash at the State Fair. The horses really seem to enjoy their time under the hose, especially when it's warm out. What a great photo of the horse getting a shower!